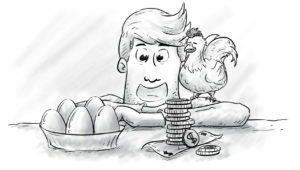 Orson’s Lessons in Wealth is a fun tale, with eye-catching illustrations, that introduces children to the fundamental principles of wealth creation. Join Orson as he goes on a exciting journey with the richest man in town. A host of memorable characters use song, dance, chickens and cabbages to teach Orson how to become wealthy. I originally wrote this book for my children; I wanted to give them the wealth information that I had never been taught as a child. In a moment of awakening during a dull pension presentation, I found myself twenty years from retirement with no nest egg to speak of. I frantically began researching how I could make up for my lack of previous financial planning and build a decent retirement income. Months of research followed. I realised that if I gave my children an understanding of the lessons I learned in my research, they would have a great head start in taking control of their own financial futures. The story and each character were created to teach Orson a valuable lesson. As Orson learns, the reader learns, and any one of the principles can be applied in the real world. Notes for grown-ups, at the end of the book, gives a summary of each lesson for discussion with the young reader. After writing this first book, I felt that some of the characters were crying out for a back story. Feedback from some children also gave me the idea to write some introductory tales to show where the characters learned the lessons that they teach to Orson. I thought I’d delve more into the poetry of the first book and create some new poems. Each poem, the first of which is The Ballad of Egg Man Jeff, can be enjoyed as a standalone tale but, in combination, they give more details of the wealth lessons introduced in first book. I hope you enjoy these fun and educational tales.